Generally speaking, I am not a big fan of carrot cake. Store bought carrot cake is a crime against taste, it's dry and full of raisins. Blech. 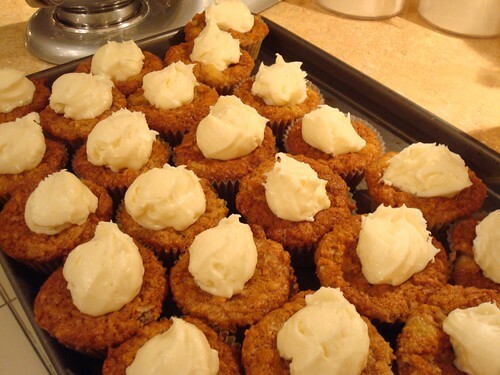 Happily speaking, my mother happens to make some of the best carrot cake ever. In an ironic twist of fate, she calls it her "Southern Carrot Cake" and here I am in the south. 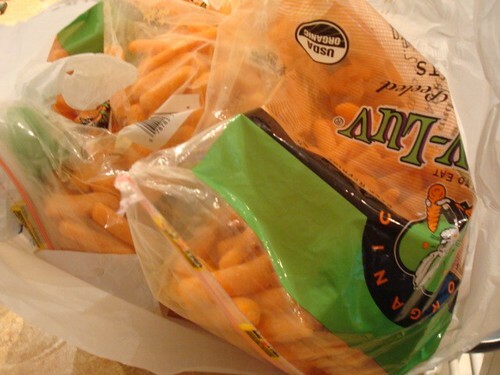 And with, no lie, twenty pounds of carrots left over from an event. So I pulled out my mom's recipe, my food processor (used only once before), and my trusty cupcake pans. I was going to make cupcakes! 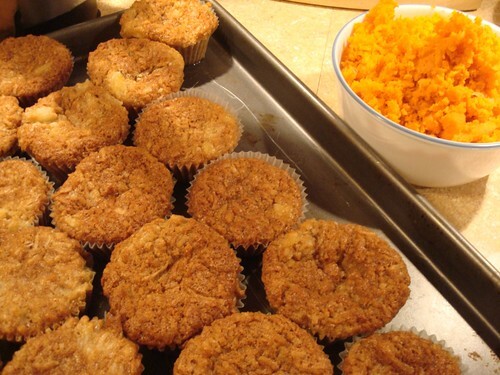 I processed my four cups of carrots and started in on the dough mixing in the flour, sugar, carrots, coconut, etc. I happily filled 24 cupcake papers and popped them in the oven. At which point, while cleaning up, I looked over and noticed...the bowl full of processed carrots. Apparently I had only imagined adding them to the batter. It should be noted that I actually did taste the batter, thought it seemed very uncarroty and continued on unperturbed. So I made "carrot cake" and did not put one iota of a dent in those 20 pounds of carrots. *headdesk* Instead, I think I will tell people they are "Tropical" Cupcakes, what with the coconut and the pineapple (and the no carrots). Don't they look lovely though? And, of course, the recipe. In a large mixing bowl beat brown sugar, white sugar, and oil until creamy. 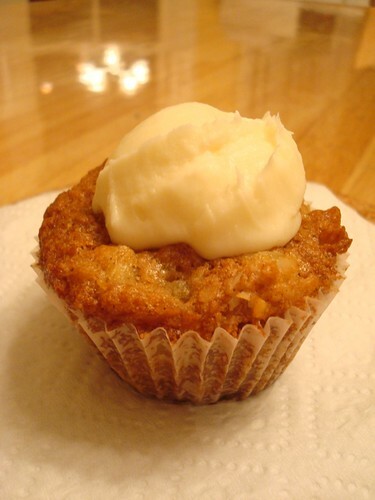 Blend in vanilla, baking powder, baking soda, cinnamon, and ginger, beat until blended. Add the whole can of crushed pineapple, including the juice. Beat until blended. (The dough may foam due the reaction of the pineapple juice and the baking soda, this is normal). Add the carrots and coconut. Time will vary depending on pan size or loaf pan. The cake will be done when a knife comes out clean from middle of pan. A 1/2 sheet cake pan takes 35 to 40 minutes. Cupcakes take 25 to 30 minutes. 1. Obviously, there was the lack of carrots. 2. Aside from that I also had to use pineapple in 100% juice as the store did not have any in heavy syrup (yay!). It was still tasty! 3. However, the 1 1/2 cups of oil was probably waay to much. The cupcakes are greasy through the liners and leave little puddles of oil behind. It may be necessary when the carrots are present, but if you are going to leave the carrots out (on purpose) I would suggest cutting the oil down to 3/4 or 1 cup. 4. Also, I had no foaming. I am very disappointed in this. >_< .